All about Ulla - ulladieeules Webseite! The best time to start educating a child on media is - unsurprisingly - around the time it gets exposed to media for the first time. For most children books are the media they experience first. Before long though, they are surrounded by a wide variety of media everywhere they go: at home, at their friends' places and last but not least at school. It is important to raise their awareness of both the positive sides as well as the risks involved in their daily use of the all media at their disposal. Used in the right ways the advantages by far outweigh the risks. Consequently, focusing on early media literacy becomes increasingly important. This ability can be acquired and fostered in a playful way from a very young age. Speaking with children about media is an important element in that process. The stories about Ulla the little owl and her friends Anna and Peter can help to start that dialogue, be it at home as parents or as teacher trying to address media literacy at school. Ulla's stories are best suited for children aged three to eight. 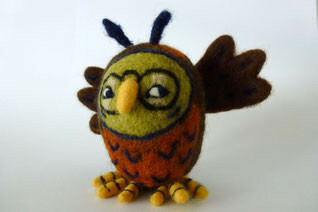 Ulla the little owl lives in the owl forest and is often visited by her friends Anna and Peter. They are best friends as well as neighbours. While Peter is still in preschool Anna is already a first grader. Together they experience many exciting and funny adventures. The full book series will consist of five books and will contain many stories about various media topics, such as age appropriate media use, learning to read, advertisement and many more. Additional materials are available on Ulla's website for free and nicely complement the books. With these working papers, instructions and ideas for active media projects, suggestions for discussion topics, etc., it enables you to emphasise specific aspects of a story after reading. -> You are interested in learning more about our Ulla project for early childhood media education? It is possible to obtain translation and publication licences. If you want to know more about Ulla or order her books, please do get in touch with us (Contact us).